I have been lamenting over at Facebook for weeks (maybe months) about the total upheaval in my craft room. I really should be ashamed because I am lucky enough to have a room where I can craft. But, that also creates problems because we can close the doors on that room and so it becomes a very handy catch-all when you don't know where to put junk that accumulates in other rooms of the house. 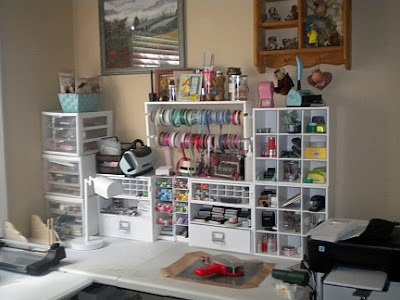 If you have a craft room, you probably know what I am talking about. Friday night I decided that enough was enough and it was time to try and put some order in my chaos! 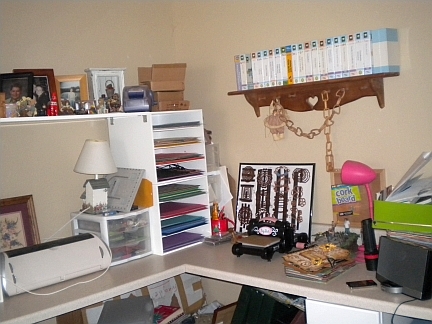 I should have taken before pictures...but I am vain enough not to let any readers see what a total slob I really am, so here are the after pictures...with a disclaimer that I tend to be clutter happy, so this is NOT a model room crafting space...if you know what I mean!! This is where most of the fun takes place. All my Copic markers, ink pads and most used tools are in this area. I bought 2 white folding tables and butted them against each other to make an L-shaped working table. I have very pretty albeit very non-user friendly low placed windows in this room so don't have the wall space I wish I could have here. There is lots of nice natural sun-light though, and that's a bonus. 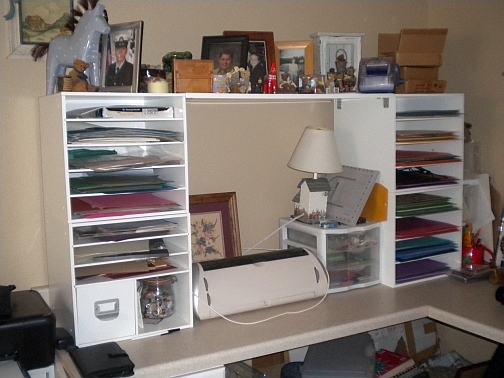 On the other side of the room is a work counter my husband built for me right after we bought the house. Like we seriously thought this would be all the space I needed? *snort! It's another L-shaped counter with some under the table cupboards. Oh, and boxes and piles of cluttering supplies and photo albums. 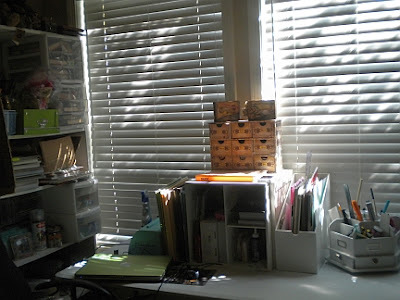 I am thinking about stacking a couple more paper shelves at the end because a girl can never have too much paper!! This is my solid paper supply. And also my cricut center. I really need to de-clutter the top of it though! So there you have it. This is where I work on all the projects I share with you. Hopefully, with less mess going on I can focus a little more on getting things made!! Your space is awesome! Bet you are glad to have it organized again so you can play more!!! 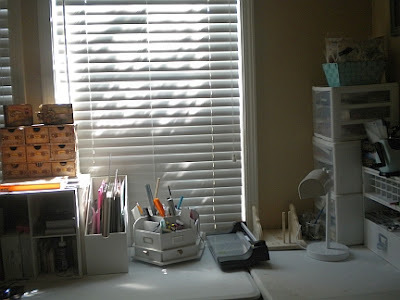 Your scrap space looks amazing!! !